Vigorous, spreading, clump-forming perennial with winged stems and lance-shaped, coarse, hairy green leaves up to 25cm long. Cymes of purple-violet, pink or creamy-yellow flowers in late spring and summer. Very tolerant but prefers a moist, slightly acid soil, in part or deep shade. From seed or root cuttings. 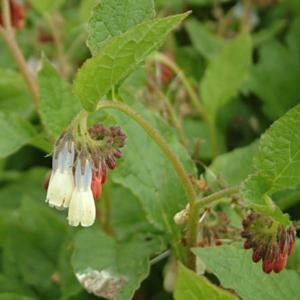 Medicinal herb traditionally used externally for the treatment wounds, burns and broken bones. Has also been take orally for a number of condition, but this is no longer reommended due to possible harmful effects.